Laptop LCD screens are very fragile and it doesn’t take much to break them. Many people believe that if you crack the LCD screen on your laptop, the replacement LCD will be so expensive that you might as well buy a new laptop. But this is very rarely the case. Our average LCD replacement costs around $165.00 including installation, sometimes even less, well below the cost of a new computer—and also well below the prices at the chain stores. Call us at (520) 425-8730 and we’ll be happy to give you a free estimate. After: As good as new! Bent or broken LCD brackets. This is a very common problem, especially for laptops with large 17″ LCD screens. Defective laptop power connectors (DC jacks). Another very common problem, which few computer repair companies will service due to the labor involved. Symptoms of this problem include: no ability to power on your laptop; battery not charging; having to force the power adapter at a strange angle to get the laptop to power up; power to laptop suddenly cuts out at random times. Laptop motherboard replacements. There are times when it makes financial sense to replace laptop motherboards–as with higher-end laptops–and times when it does not. At Tucson Computer Repair Service, we will be straight-forward with you and give you an honest opinion as to whether this type of repair is right for you. 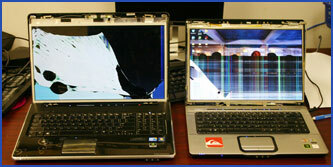 Cracked plastic LCD top covers or front bezels. All facets of Windows XP, Vista, or 7 software troubleshooting and repair. Laptop data recovery or transfer.